View of the ROV van control room. Photo by Art Howard. 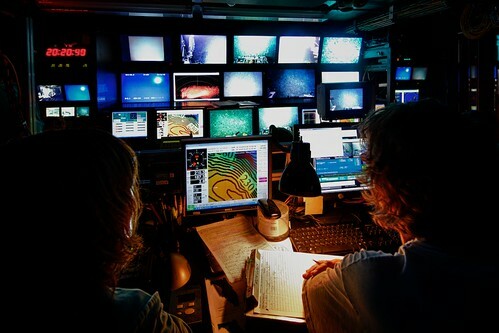 In the ROV control center, referred to as the “van,” there are three tasks that the science crew performs The lead scientist determines to which locations the ROV will be moving and indicates which specimens are to be collected. The event logger records specimens collected and other items of interest during the dive. The DVD manager monitors DVDs and the hard drive used to record the entire dive. During any dive, at least three of the ROV crew are also present in the van and they monitor Jason’s systems and manipulate the mechanical arms. When entering the van, one immediately sees over 20 video screens mounted to the walls. Masses of wires and cables are neatly arranged throughout the room. Virtual reality style gloves used for manipulating the ROV’s arms sit at the pilot’s seat. It is amazing to think about the amount of time and expertise put into developing, building, and arranging a technological feat such as the Jason ROV and its van. 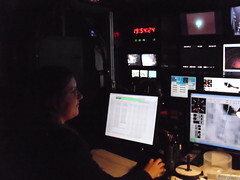 Beverly at the DVD controls in the ROV van. Photo by Jana Thoma. Tonight my role in the ROV van was the DVD manager. While this sounds like a seemingly simple task, there is a lot of room for error. Thankfully I had some guidance in preparing for this task. I had second watch, the afternoon shift, so my time frame was from 2–8 pm. I arrived at the van a little bit early, so I could be brought up to speed on the timing of the video recordings. The role of DVD manager isn’t just pressing the record button on a DVD recorder. That would be too easy. First of all, there are twelve DVD recorders that must be monitored at the same time. Then, there is the high definition video hard drive that must be recorded hourly to prevent file sizes from being too large. Data must then be logged into two separate spreadsheets. The DVD start and stop time, mission number, and dive site is recorded on paper and in digital form. This information is also recorded for the hard drive. Then labels containing this information must be printed and put onto six DVDs, two each for the Pilot Cam, Science Cam, and Brow Cam. Now imagine recording all of this information in Zulu time. For example, 2:00 pm would not be 14:00 as it would be in military time, but would be 19:00 in Zulu time. Although managing the DVD’s was a bit confusing at first, I quickly got the hang of it. Having a role to play in the ROV van made me feel as if I was part of the larger context of data management for marine research. During the Extreme Corals Expedition, I have gotten to be a part of active field research and have seen how important recording data is. I have helped label sponge and Gorgonian specimens collected and recorded information for genetics research. Recording videos on DVD and the hard drive in the ROV control center doesn’t sound like a really important task, but without this video, scientists would not have information about their specimen’s natural environment and habitats.